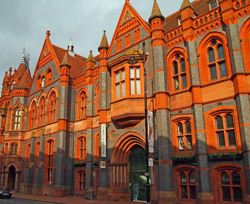 Berkshire's county town of Reading, is a market centre, a major railway junction and a popular university town. Reading was made rich by the cloth trade in the Middle Ages and began a rapid expansion during the 19th-c, with the introduction of the canal and railway. The town is linked with many great names such as Sutton Seeds, Huntley & Palmer biscuits and the brewing industry. 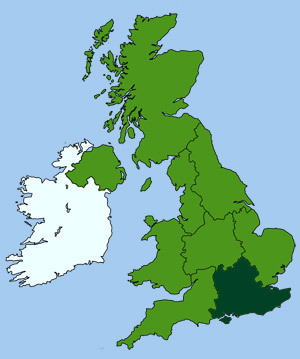 Reading's history as a settlement stretches back more than 2,000 years to the Romans, who had many farms and villas in this area. Henry I founded a Benedictine Abbey at Reading in 1121, and he now lies buried in its grounds. The abbey's 13th-c inner gateway was lovingly restored by the Victorians, but the rest of the abbey still lies in ruins. 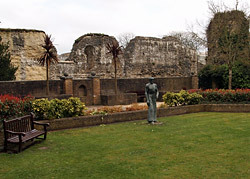 The Forbury, an open space between the town and the Abbey grounds, has been a traditional meeting place for centuries. Today it has been preserved as a public park and gardens. The town centre has been recently revitalised with one of Britain's finest shopping centres, 'The Oracle', which incorporates an attractive riverside frontage. Other shopping Centres include; Friars Walk, Broad Street Mall, West Street, Market Place and the Butter Market. Reading Jail, was made famous by the poem The Ballad of Reading Gaol, written by its most famous inmate, Oscar Wilde. The jail is immediately east of Reading Station and can be identified by its red-brick walls and turrets. It was at Reading Station that Lawrence of Arabia lost most of the manuscript for his book 'Seven Pillars of Wisdom', while changing trains here in 1919 . It was his only copy, so he had to re-write it from scratch. Located in the The Town Hall, it tells the story of Roman occupation in Berkshire and the surrounding area. Prime exhibits are antiquities from the great Roman site of Silchester, including a Roman Bronze Eagle. Describes the 200 year history of rural life and farming in England, when the horse dominated the countryside. Farm wagons, ploughs, scythes, butter churns and vintage tractors are among the thousands of items preserved, together with over 300,000 photographs. Reading Abbey was founded by Henry I in 1121. Now a picturesque ruin, it was once one of the richest abbeys in medieval Britain - making Reading one of the most influential places in the Thames valley. Following its Dissolution, in 1539, the buildings rapidly disappeared and its stones were reused in the locality. These two museums form part of The University of Reading. The Museum of Zoology exhibits include hundreds of animal skeletons and zoological specimens (including dinosaur eggs), which demonstrate the rich diversity of the Animal Kingdom. The Ure Museum of Greek Archaeology contains one of the largest collections of Greek ceramics in England. Other artifacts include prehistoric pottery, metal and stone artifacts of Roman and Greek origin. There is also a large collection of Egyptian antiquities. Located at Blake's Lock, by the River Kennet. Housed in a range of old canal building and a brick-built Victorian pumping station, the museum recalls Reading's historical waterway life, trades and industries. Exhibits include a number of reconstructed shops from the 1900's and a model railway.